In this post Wataru Nomura, who works with the Japanese Ministry of Land, Infrastructure and Transportation and studies City Planning at MIT, lays out his predictions for Japan’s post-disaster reconstruction plan. A 9.0 magnitude earthquake hit the northeastern coast of the Japanese mainland on March 11th, 2011. It killed more than 8,000 people and 10,000 people are still missing. This earthquake, along with the ensuing Fukushima nuclear power plant crisis, has become the worst natural disaster Japan has ever faced. Although earthquakes are part of everyday life in Japan, this is different from those we’ve had before. Along the coastline from Iwate Prefecture to Fukushima Prefecture, the tsunami destroyed 100 of the 190 total miles of sea wall and razed dozens of coastal towns to the ground. In contrast, in the Great Hanshin Earthquake in 1995 killed about 6,400 people and about two-thirds of the dead were in just one city, Kobe. Before coming to MIT I was at an agency of the national government where I worked for both metropolises and small islands, so I understand the complexities of these coastal towns. When I heard the news of the quake and knew where the epicenter was, I was concerned about a friend who moved to the area and has opened a guesthouse on Tashiro-island, which is near the areas hardest hit by the earthquake. Fortunately, some messages on Twitter implied that the residents were safe, although no formal news was found yet. Many of the coastal towns that were damaged by the tsunami have characteristics similar to these islands I’ve worked for: beautiful nature but limited access and small, declining populations and industries. While this earthquake has damaged both densely populated areas and areas with small populations, the damage to the smaller towns seems indescribable. It is reported that the 80% of the houses in Minami-Sanriku Town were destroyed. 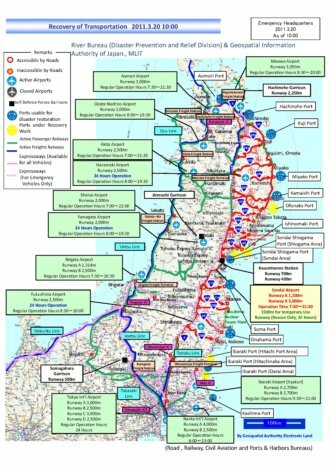 In addition, while the major road network is being restored swiftly (see this map of transportation recovery), the roads to small coastal towns seem to be still disconnected. When considering an expected restoration process, I am personally concerned about how these small towns should be restored.
. Ministry of Land, Infrastructure, Transport and Tourism. Although formal restoration processes have not yet begun, from my experience of working at the Japanese Ministry of Land, Infrastructure, Transportation, and Tourism, I will try to illustrate the expected process and roles of the different levels of governments. The expected restoration processes will most likely be divided into three major elements: (1) restoration planning, (2) housing supply, and (3) urban infrastructure. First, the national government will organize a commission to produce a vision for restoration immediately after figuring out the entire damage. Prefectural governments will then make long-term restoration plans and plans for specific sectors, such as economic restoration, housing supply, and infrastructure restoration. Cities will create their own restoration plans as well. While a national vision will be an overall strategy made mainly through discussions within the commission, the prefectural and municipal governments’ visioning processes will be open to public. Housing supply is essential for restoration. The prefectural and municipal governments have already begun providing temporary housing, which is required for those who lost their houses. Due to Japan’s experiences from past earthquakes, temporary housing will be provided quickly and efficiently. While the lack of land was a major constraint in the case of the Great Hanshin Earthquake, the less-dense areas that have suffered this earthquake seem to provide enough space for temporary housing. In emergencies, the national government extends financial support and asks the temporary housing industry to build the required amount of housing as soon as possible. The next phase is to provide permanent housing. In urban areas, public housing will be provided by prefectural and municipal governments with financial support from the national government. When victims cannot afford rent for public housing, the governments will provide additional financial support. Although public housing will be provided according to the needs of those who live in temporary housing, it is difficult to match their needs because sufferers usually want to live close to their neighborhoods. Restoration of urban and rural infrastructure is another issue. Infrastructures are usually restored by the organizations that built and managed them prior to the earthquake. For example, in Japan, roads are built and managed by the national governments, prefectural and municipal governments. In cases where municipal governments are facing serious damages, the prefectural or national government will replace the municipal in this role. In urban areas, prefectural or municipal governments will restrict individuals from building new houses in order to apply street widening, height restrictions, and other planning measurements. While the public sector thinks that these measurements are important in densely populated urban districts, landowners usually want to rebuild their houses as soon as possible. In order to mitigate this conflict, the governments will immediately plan and execute land readjustment projects, which will receive financial support from the national government. One of the greatest challenges will be the restoration of the damaged small coastal towns. Because each town is located along a drowned valley, it is difficult to find land for new development. In addition, the tsunami has decimated their major industry: the fisheries. Because the budget for restoration is not infinite and should be used efficiently, some of the devastated villages will have to be transferred and merged with other villages. Although it would not be hard to reach a consensus on this issue, hopefully the decision will be made within communities and local governments rather than through an exclusive authority. Overall, most projects for restoration will be conducted by prefectural and municipal governments, supported by the national government. It is difficult to include victims, most of whom are elderly, into the initial phases of restoration planning because they have to do their best to restore their basic lives. However, if they do not join the processes, the decisions will be made according to efficiency, which might result in losing villages. Prior to the earthquake, many of these areas were already in economic and social decline due to depopulation of younger generations. The future of the nuclear power plants in Fukushima seems still unpredictable, and a formal restoration process is yet to be known. However, the suffered areas are moving toward the future. Even in Minami-Sanriku Town, where reports stated that “the whole town is gone,” 80% of the major road network amazingly became accessible in just one week. When I worked for the small islands five years ago, I learned and experienced the difficulties in revitalizing the areas with decreasing populations and industries. Since the earthquake hit Japan on March 11, 2011, every minute of the news coverage has delivered the voices of people in Tokyo, Osaka, and other large cities concerned about the difficulties the victims face. Restoration should become a step not just towards recovering to the previous conditions, but revitalizing the regions to make them better. Restoration is a long process that will take many years. I do not know how long the attention and concerns of urban residents in Japan will last. There is a specific Japanese word for obliviousness toward victims and natural disasters. It is literally called “weathering,” as if a stone is placed outside and forgotten for a long time. After graduating from MIT, I will go back to Japan. I hope to work on keeping the awareness that is needed for restoration so that the damaged areas will not be “forgotten” again. Thanks for sharing your thoughts, Wataru. It’s great to see you thinking about what is possible in the future, when things seems so dire in the moment. Thank you very much for the post. I’m very interested in this having studied forms of community participation in Japanese machizukuri projects for my undergrad thesis. Prior to this disaster it seemed as if community involvement in local projects was becoming more in demand, and people were starting to look at aspects of planning aimed at enriching rather than just insuring quality of life, as well as preserving historical architecture and natural scenery. The case of Tomo no Ura residents blocking the new route that was going to cut across their scenic port comes to mind. Now that basic infrastructure is such an urgent need however, I wonder if these kinds of ‘nonessential’ considerations will fall by the wayside, be deemed inappropriate or dangerous (choosing not to widen a road etc), or be simply, as you say, out of the picture for disaster victims who must focus all of their attention on rebuilding their basic lives. What do you think? It would seem that somewhere beyond the immense challenge of restoring infrastructure there will also come a need to restore a sense of place in many of these communities, deal with the lost familiar landscapes and psychological toll of rebuilding, as well as search for new methods of economic development to supplement struggling industries. Creative forms of economic revitalization could rely heavily on a well defined quality of place and improvements to livability to attract newcomers which may be difficult to attain if not planned for early on; but the kinds of things achieved in Kobe’s earthquake revitalization may be difficult or impossible now given the scale of this disaster. I’m so impressed by the attitude and determination of people in the north east to pick up the pieces, exemplified in the video with over 1.7 million views on youtube of a smiling old man saying “lets rebuild!” (http://www.youtube.com/watch?v=2zeroCZSrjo). I have to believe they will take a strong role in the process of planning the future of their region eventually, even if the immediate restoration process must be more bureaucratic. Do you have any predictions about the role civil society will take in the recovery and how it might be worked into or kept out of the public sector efforts? again thank you for sharing your perspective; I wish you the best in your studies! Wataru, thank you very much for your post. Hearing it from your point of view written in this way is very insightful for all of us here at MIT, as planners, but also, as your peers and friends. This “weathering” has to be fought here as well as there. Wataru, this post is amazing! It is fascinating to hear about how the ministry where you worked is thinking about recovery after the quake. The point you raise about this small coastal towns is very striking. There is probably so much history in these small coastal towns that will be lost if they decide not to rebuild. It seems that we are starting to now see the real consequences of depopulation of rural areas in Japan. I think what is also very interesting is that the government is playing such a strong role in rebuilding permanent housing stock for the affected areas. I think about how parts of New Orleans are still not rebuilt years after Katrina, and how slow the US government was to react to this crisis. How does the government fund rebuilding private homes? How much of these costs do they cover? Counterintuitive as it may seem, the Japanese Ministries of redevelopment now have a great opportunity to improve the physical and social conditions of these smaller cities. Considering the factors of production to which this potential success hinges on, innovation and the perceived shadow value released by the Tsunami, are the primary drivers for systemic and longer-term improvements. Of course, we cannot disregard the significance of trauma, and the required deployment of immediate triage, but although these are necessary conditions for improvement, they are not sufficient. Unfortunately, the window for implementation is narrow, albeit critical, since it entails the effect behind path dependence. Design and implementation is the systematic reduction of possibilities, the initial steps and choices, to a great degree, predict what has to follow. With time being short, I’m up for a idea/design charrette this weekend with our classmates if any are willing? Wataru and DUSP, of what we have to offer in the immediate, this seems the best use of our time and collective ability. After reading your comments and talking with Erik in person, I think it’s important to create a new baseline for planning of these small coastal towns. This should be different from the existing one because they have been already suffering from long-lasting economic hardship and decreasing population prior to the earthquake. This earthquake is a critical but additional incident to the series of difficulties they have faced. It is clear that the existing policies, which have not been successful in reviving these towns, will not work after the massive natural disaster. When creating this new baseline, collaboration with people in the metropolis and other countries will be essential to find new, hidden resources, which include a sense of place and history Nick and Steph mentioned. Based on this baseline, I hope, local people and local governments may vision a better future of these area. Btw, the governments will not issue a direct financial support for private housing while they will build public housing low and middle income citizens can rent. In addition, sufferers will receive long-term financing at low interest rates from the Japan Housing Finance Agency. Erik, Thanks for your suggestion. I can talk this weekend or after we have more information, because the current news from Japan are mainly filled with the Fukushima’s nuclear power plants…I have not heard tangible news about restoration yet.